One cake mix, many gluten free variations. We provide you with a basic mix, you add your additional ingredients to create your gluten free masterpiece! Some ideas include: gluten and dairy free carrot cake, banana cake, apple cake and zucchini cake. The possibilities are endless and the recipes are easy – simply toss in the mix and add your extras. 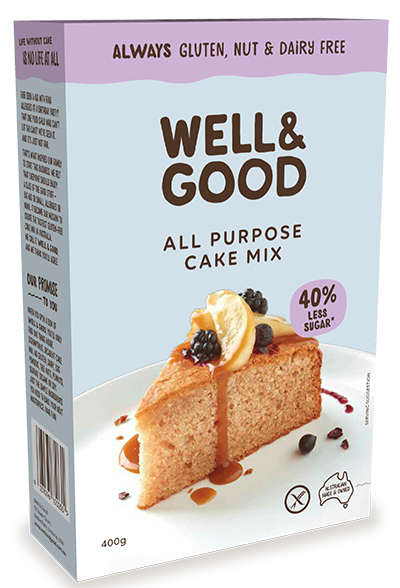 Our gluten free all purpose cake mix is free from: gluten, wheat, soy, dairy, tree nuts and peanuts. Better still, our entire factory is purpose built to manufacture these allergy free products so you don’t have to worry about traces of them in your food. This is a recipe to make our all purpose cake mix. This recipe allows you to fold in any flavour of your choice – apple, cinnamon, banana, coffee, the choice is yours. 2. In a large bowl combine cake mix, eggs, water and oil, stir with a wooden spoon or an electric hand mixer on low until all ingredients are incorporated and batter is smooth. 3. Fold in flavour option of your choice. (Banana, Carrot, Apple) and pour batter into prepared baking tin. You’re invited to this party, too. Simply replace 3 eggs and ½ cup of water with 1 teaspoon of GF baking powder, 1 ¼ cups of your choice ‘non-dairy milk substitute. (Soy milk is best; rice or almond milk will produce a soft and fluffy texture on the inside with slight cracks on top.) and make sure to Increase your baking time 50-60minutes. Gluten free flour mix (rice flour, corn starch, maltodextrin, tapioca starch,), brown sugar, non aluminium raising agents (450,500), thickeners (1412, 415, 461), vegetable emulsifiers (471, 475), natural vanilla flavour, iodised salt, colour (caramelised sugar), spice (cinnamon), stevia. When you open a box of Well and Good, you’ll only find one thing inside. Scrumptious, decadent cake mix. No gluten, dairy, egg powders, tree nuts, peanuts, seafood, sesame or soy. Just the simple ingredients you need to bake your next masterpiece. Have fun!